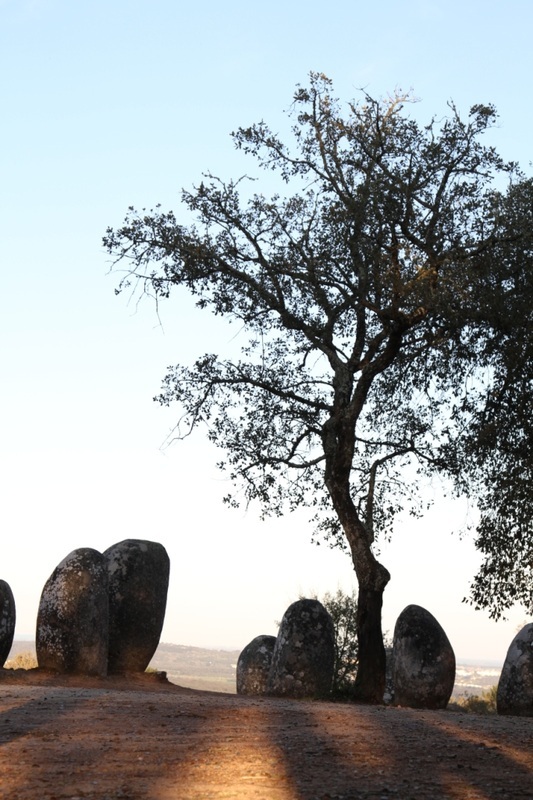 Close to 450 megalithic settlements have been discovered in Alto-Alentejo: the highest density in Europe. In addition, around 800 dolmens and lots of menhirs and a few cromlechs are known (dolmens are collective graves, menhirs are upright standing stones and cromlechs are stone circles). The numbers are impressive and this is just what survived a period of 5000 to 7000 years. Many may just have collapsed or been destructed to provide material for houses or pavement in later times. Some dolmens are even in use without having been destructed: they are now part of the walls of chapels. The dolmens are burial grounds. They consist of a circular chamber and often a portal directed towards the east. The Anta Grande do Zambujeiro is the biggest dolmen of its kind in the world with a burial room of nearly 6 meters high. The seven stones that make up the wall must weigh hundreds of tons. It is a miracle how they managed to put them upright. Most dolmens are much smaller: around two meters in height and three meters in diameter. With some luck you can find (the remains of) a dolmen yourself. That happened to Ludger: he found one in the middle of an oak plantation on just a 20 minutes’ walk from our house. Its existence was a surprise to the cultural Department of the municipality: there was no documentation or record. And George Moore, an artist-in-residence in 2010, found two on less than 10 minutes from the house, but these were in such a bad shape that they were hardly recognizable. Dolmens were generally covered with rubble to create an artificial hill. In thousands of years the hill erodes and the stone structure appears. But some (or maybe even many) dolmens are still completely covered. This awareness works addictive when you scroll through the countryside: each elevation in the landscape that does not look natural may contain a dolmen. Menhirs rang in height from 0,5 to 6 meters. They sometimes stay solitary in the landscape but ofther are part of a cromlech. Most menhirs remind to a phallus, some to an egg. Rarely, menhirs look like a giant mushroom (some refer this form to a uterus). The cromlech of Almendres consists of 95 menhirs. This stone circle is estimated to be 7000 years old (compare: Stonehenge and the Egyptian pyramids were built 2000 and 3000 years later). Some menhirs have stone carvings that clearly relate to annual movement of sun and moon. Other carvings on menhirs and on utensils fount in dolmens, seem abstract (often geometrical) ornamentations. Of course there is the question of “diffusion or evolution?”: did a foreign civilization bring this building skill to this region or was it developed here? The dolmens look like crude copies of those found in the Middle East and have similarities with the dolmens in Northern Europe. Based on Carbon 14 measurements it is now sure that the megalithic objects of this region are the oldest of Europe and the Middle East. But this does not say that this building skill was distributed from here to other counties and continents. It may be part of a general social development that many civilizations undergo once they shift from hunting to farming. Dolmens are also found in Japan and Madagascar, for instance. Visiting a megalithic monument triggers imagination and emotion. Some visitors clearly feel energies or cosmic impacts. Others feel connected with people over a time span of 7000 years, which make you feel both small (“what a tiny part of human history is mine”) and rich (how fortunate that I am part of this continuum). Some visitors consider that people built structures that survive 7000 years while nowadays we build with a depreciation of 25 to 50 years. Others speculate on the civilization, its rituals, values and daily life. Little fantasy is needed, for instance, to image that the burial chamber and portal of a dolmen represents a uterus. And that for this prehistoric civilization being buried in a dolmen means finishing the circle of life or waiting to be reborn. On the highest point of our property is a flat rock that indicates solstice: its axis points towards the place on the horizon were on 21 June the sun sets. Even although this may be purely co-incidence it is highly intriguing for all of us.